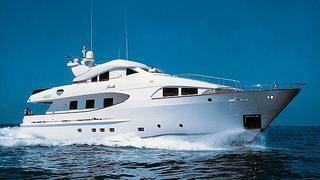 Tom Barnes at bluewater tells me that his central listing, the 29m motor yacht Novela is now sold to a direct client. Built by CBI Navi in 2000, Tom says Novela has had only one owner since new and has been very well looked after, with less than 1000 hours on her engines. Accommodation is for eight guests in a master suite, VIP stateroom and two twin cabins while a pair of 1050hp Caterpillar engines give her a maximum speed of 15 knots and a range of 3,500 nautical miles at 13 knots.